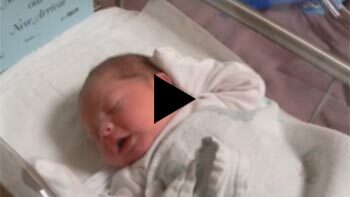 Customize your video by including your own music choice for your DVD Video Slideshow. A Jump Point is a "Chapter" in your video, you can have as many or as little of them as you want. When you are organizing your order, the name you give each group is the name we will assign your jump point. 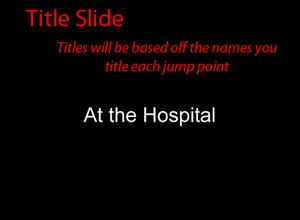 A title slide appears at the beginning of each Jump point and will announce the title of the images you are about to view. If you have a title for your entire project let us know in your special instructions, and we will add it to your menu page. Customers choose things such as "Smith Family Memories" or "The Life of John Smith." 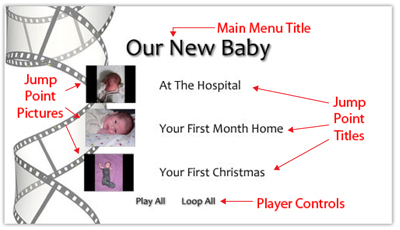 Adding music to your DVD Video personalizes your project. You can choose from our music options, or send in your own music. Once you have selected the music you want to use, you will want to tell us in the special instructions section on your order form. If you decide that our library of music isn't a good fit for your Slide Show, send us a CD or MP3 files that you legally obtained, and we can use your music. Images will be on screen for 5 seconds, with a 1-second fade-in & 1-second fade-out, totaling 7 seconds of screen time per image. You will want to provide approximately 7 seconds of music per image for each chapter on your Slide Show. Songs will need to begin & end in the same chapter. We can sync your Slide Show to the duration of your music so that it will end in sync with the song, but you will want to get close to 7 seconds per image. You can still take advantage of all the features we offer, such as jump points, title slides, background music, main menu titles, and PC Slide Shows. Just give us a call and we can price out your project! 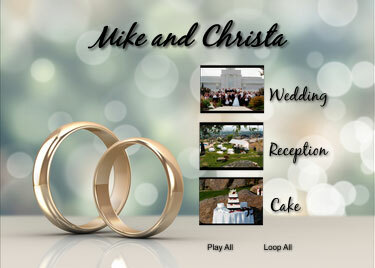 If you would like a Custom DVD slideshow of your wedding day, we have just what you are looking for. You can customize it so it's perfect to remember your special day forever. For more information and options, see our Wedding DVD Slideshow. If you are looking for a custom DVD slideshow of you and your significant other growing up to show at your wedding reception, we can help! We have lots of tips you can do to help make this extra special. 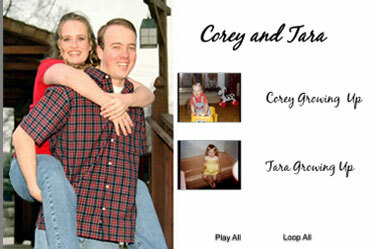 For more information and options, see our Growing Up Wedding Slideshow.